The HR Realities research 2018-19 is now open! What’s really happening in HR today and is it ready for the future of work? New research from Fosway and UNLEASH aims to find out. Take part in the 2018-19 HR Realities research now by telling us your thoughts on your current challenges – from HR technology, to digital transformation, to investment and future skills, your experience and insight matter. With over 600 HR leaders taking part last year from across Europe, this research gets beyond the hype and captures insight that is not available anywhere else. 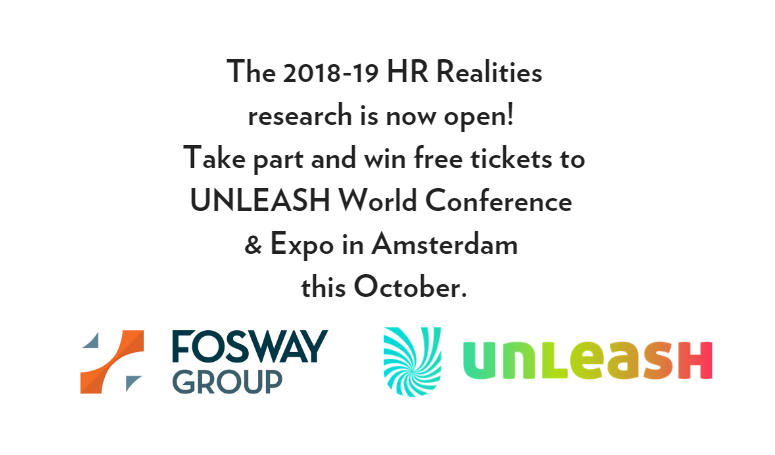 Complete the survey now and you can win tickets to join us at the UNLEASH World Conference & Expo in Amsterdam in October. This research aims to support European HR leaders and professionals in making informed decisions around their HR strategy and investment by providing a real, independent and relevant picture of HR today – and what it needs to have in place to support the organisations and the workforce of tomorrow. And the outputs aim to create a trusted resource that enables HR to take an increasingly strategic role in shaping the future of work. HR has a major role to play at a time of huge disruption and change. Digital transformation is happening whether people are ready or not, but the answer isn’t simply just using more technology. This research will help our community see where their peers are on their digital journey, as well as what is really being adopted and what is not – helping inform the important decisions of today, with reference to the challenges that lie ahead tomorrow. Employee engagement has unequivocally become one of the leading measures of success for HR today. More important than HR having a seat on the board, or being an employer of choice, or even building a strong pipeline. But considering its growing importance, the technology solutions around employee engagement and wellbeing are still in their infancy in HR tech terms. Along with exploring the strategic importance of HR in organisations’ Employee Value Proposition, the current reports are still available to download now. NEW! Take part in the 2018-19 research open now!